If you are a regular reader of this Blog about Neuro Linguistic programming NLP is Fun you will know I love to speak about the power of Mind and Body, Mind Body being one cybernetic loop. Your brain influences how you feel/heal and your Body Influences how you Feel/Heal in your Emotions. Using your physiology to release good brain chemistry then is essential to creating great states and real Power moves. Btw, do you regularly work out ? If you use your body to move and really challenge yourself, you will know it feels amazing. If you haven't managed to get on track with working out just yet then this blog post may be of great interest to you and could easily be a great way to begin. 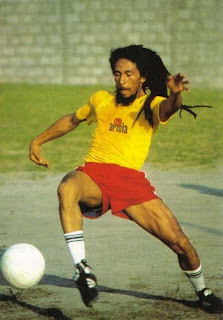 Bob Marley Playing Football in between Concerts for Mind Body Exercise. Believe it or not allot can be done in 4 minutes and you can certainly get your heart rate going. And Power up the Strength and Intensity. I love to challenge myself on a High intensity Run or Power walk in the morning for about 45 minutes to an hour. Later in the day, I frequently use 4 minute intervals to ramp up energy it throughout the day and do the exercises that are more challenging to do all at once. Stuff like sit ups, crunches and Planks. Sometimes I do Yoga just to release tension, clear my mind and energize powerfully at the same time. There are lots of short video's you can follow along with too and the warm ups alone get your energy buzzing powerfully. Find out more about 4 minute intervals and the power of it here, and watch this fun warm up video. Perhaps you would like to join in too this is a Great 4 minute Fun work out just notice yourself feeling energized after moving a little bit to this. Get this 4 week NLP Online Coaching course.